You're wondering what the connection is, right? Dino fever is spreading and I'm feeling slightly powerless against it. And it doesn't stop there, of course. PBS brings us Dinosaur Train (dinos and trains, the other toddler obsession... those people are geniuses), which is a big hit in our household. When I heard a child screaming "All aboard!" at the park this past weekend, I knew it was my little cherub. Trek -- I'm convinced that with a name like Trek, this child actually belongs to Sarah Palin. Cory -- The lovable, overweight best friend, whose every bit of dialogue revolves around a search for food. C'mon writers, give the hungry kid a story line! Ricardo -- This future quarterback is going to look back on high school as the good years. Kami -- Mean Girl in training. Angie -- I actually quite like her. She's the sweet girl-next-door and Dan's future girlfriend. At least I hope so, for his sake. So here's the deal. As a result of this revelation, I'm going to try and forget about Ricardo and Kami, who I suspect will date one day, and Cory's recurring quest for snacks. I'll forgive Trek's penchant for being loud and obnoxious, which I suppose is just the role of little brothers. I'll attempt to suspend disbelief and embrace Dan's T Rex size imagination... oh man, I'll try my hardest. Dan's Mom, with your ill-fitting mom jeans, this is all for you! 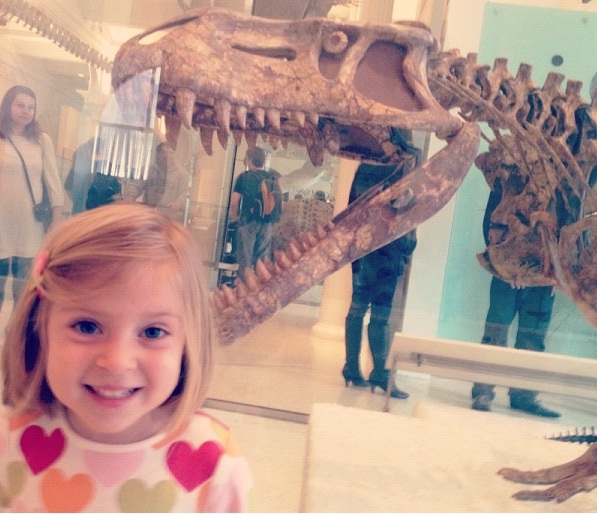 And for my little gal, who, like Dan, can't get enough of all things dino. Okay wait. What happened to Barney?? ?